After using chain garages and feeling ripped off, I had started to become disillusioned. When 4 weeks after a terrible service I started to hear some noises on the passenger side I asked some colleagues for their recommendation. The first two people I asked both strongly suggested Andrew Wood so off I trotted to get my car sorted. The guys at the garage looked after my little car very well and I was really happy with the service given, the repair and the price! They quickly dealt with my issue and were really accommodating. I even got a lift back to work! "A+ customer service and A+ on price and quality of the repairs!!!" From the first moment I called and spoke to Andrew Wood, I knew I was in good hands -- as a woman I am used to being given the runaround and being treated like I know nothing and shouldn't dare question the mechanic -- but Andrew Wood's customer service, reassuring voice and respectful explanation of what the repairs would entail left me feeling blessed that I had found such a company so close to home. The work was very affordable, a third less than others quoted me, and the work schedule was flexed to allow my repairs to be done in a hurry. They phoned me each step of the way to ensure my agreement with every facet of repair and MOT, and test drove the car to make sure it was all working fine. To top it off, the pleasantness of dealing with ALL the staff at every level was such a surprise that I can't help but say that if I ever need work again, I'd drive five hundred miles to have it done here. I live in London and wouldn't hesitate to come back for anything. They are that good!!! I highly recommend them and please know this is a genuine review and I knew none of the people at this company before I went to get a quote. I am just so impressed I will recommend them to all my friends. You won't be sorry for seeing the staff at Andrew Wood. Customer service, quality of repairs, price of work. 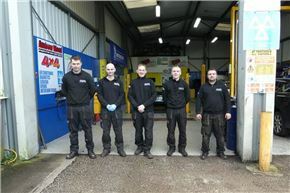 "good well equipped with well trained mechanics"
"Has a merchanic for over 25 years, Andrew Woods is the only garage I trust to work on my vehicles, having tried many over the years, totally honest man." I first started to use Andy in 2009, to MOT my van and family cars after a while I released some of the repairs due to other commitments I had, however, I have always been looking for a garage to take over the repairing of all my family vehicle, but couldn't find one I didn't loose trust in after a few dealings. to cut a long story short, Andy and his staff have been caring for all my vehicle since 2011, in fact, I'm off to Andy's today to collect my Merc. I have 3 cars. Andy and his team service them all. The work is consistently of the highest quality and the service is comprehensive and friendly. He will ring and discuss if a problem arises and will discuss the costs of manufacturers or OEM parts. I would recommend without hesitation. "Andrew Woods is living proof that if you treat your customers fairly and honestly, they will come back time and again..."
Booked a MOT on the internet - answered promptly, MOT done promptly. Had no probs whatsover. Recommended. My car needed a fair amount of work including a cam belt change, some servicing and an MOT. Andrew dealt with me personally and booked me straight in. He offered me the choice of OEM or aftermarket parts, giving me the price of each. He found a multitude of other repairs I needed, and phoned me up first before commencing with the work. Other garages might do the work, then surprise you with an unexpectedly large bill. He gave me an accurate price and time estimate beforehand, and showed me the old parts to prove the work had been done. Throughout he was friendly, helpful, courteous and polite. The work was carried out to a high standard, quickly, and at short notice. I have no hesitation in recommending this garage to anyone. "highly competent,honest,non-patronising,friendly,reliable,swift and extremely reasonable." I drove up one morning hoping for an appointment in the next week or so and not to be met by the typical smugness and lack of interest one encounters at the average garage.I was immediately attended to by Andrew himself who was friendly,attentive and non-patronising.He even came on a test drive there and then to identify my ''funny noises'' which he did with ease. The car was taken in straight away and I was already very pleased and surprised at the way I was treated and the obvious high degree of knowledge and competence possessed by Andrew and his team.I had just bought the vehicle and it had one or two issues that needed sorting and made it clear that I was prepared to spend a few quid to put it right.At anywhere else but Andrew Wood that would probably not be a good idea but my gut told me that I could trust this garage not to rip me off.Fast forward a couple of days and my (sizeable!) gut had done me proud. Every problem had been corrected to the highest standard achievable but to the lowest price imaginable.I could have wept.I had found that Holiest of Grails....'THE GOOD GARAGE'. Actually Andrew Wood Motors are superb and I will never go to another garage.They deserve to be No.1 in any chart. John F. Derbyshire. "A proper garage providing excellent, prompt service." My exhaust was blowing so, being new to the area, I visited this website, and as a result of what I read, called to Andrew Woods on spec. Monday a.m. On arrival I was asked to wait 10 minutes for a ramp to become free to allow inspection and diagnosis. This revealed a split in the exhaust by the Catalytic converter. Only fifteen minutes later I drove out of the premises with my problem solved, and at a fraction of the price. As a result I have no hesitation in recommending Andrew Woods to anyone reading this review! Thankyou for superb service and prompt attention. Tom H.
"Friendly, professional and great value"
I have had two different jobs done here following a friend recommendation; this is definitely the best garage I have used in twenty years of motoring. I do a fair amount of home car repair and servicing, so I have some idea of the difficulty and cost of mechanical jobs. In both cases the work was done ahead of time, for less cost and to a higher standard than could be reasonably be expected. The final great thing about this garage is the friendlyness and enthusiasm of the staff. Very, very happy with the work and will not be going anywhere else. Thank you. Trust in your mechanic seems to be a very rare thing but that is exactly what I have in Andrew Woods garage on Chunal Lane, Glossop. They have always diagnosed the problem correctly (first time) and have never over priced me on any job, done with speed too. The team at the garage are great, from the bottom to the top. Lovely lads, very genuine people and hard working. "Great garage, very trustworthy and honest servicing and repairs "
I've been taking the cars I've owned to Andrew Wood for over 7 years now and have never had any problems at all. They have always been able to diagnose any issues the cars have had and the quality of workmanship is always very high. I've had several different makes over the years and their depth of knowledge is very, very good. I'd have no hesitation recommending them to anyone and would trust any car I own in their capable hands and definitely wouldn't take my car anywhere else.